Image: DC Comics. Art by Evan “Doc” Shaner. Last year, the biggest surprise from DC Comics’ radically re-invented Hanna-Barbera comic book series was The Flintstones title written by Mark Russell. It was filled with prehistoric hipsters, existential dread, and dark philosophical undertones. Russell has even more messed-up stuff in store for Fred, Wilma, and... Snagglepuss? The Flintstones—illustrated by Steve Pugh, Chris Chuckry, and Dave Sharpe—wound up getting nominated for an Eisner, the highest award given to the comics industry’s best work every year. It’s achieved a cult-favorite status amongst those who’ve read it, because it infuses weighty intellectual dynamics into an animated world initially built on goofy jokes. I had the chance to speak with Russell at New York Comic Con a few weeks ago. 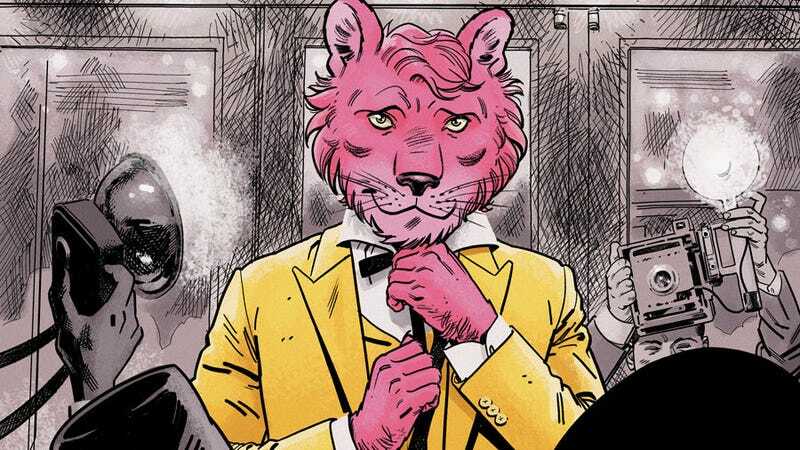 He’s got more ideas for more Flintstones, but Russell’s focus has been on Exit Stage Left: The Snagglepuss Chronicles, a six-issue miniseries which casts snarky saber-toothed tiger Snagglepuss as a gay, politically persecuted playwright in 1950s New York. In the edited and condensed interview that follows, Russell talks about how he’d reimagine a favorite Flintstone character and the melodrama that will surround Snagglepuss in Exit Stage Left. io9: What was the most surprising thing about the reception of the Flintstones reboot for you? Mark Russell: How uniformly positive it was. I expected it to provoke a strong reaction, because it’s so radically different than the old Flintstones. I expected some people to like it and some to really hate it. And I was pleasantly surprised by how many people genuinely loved it. Just took to it right away. io9: Did you hear back from readers who grew up with the original version of those characters? io9: One of the things I loved about the first two volumes was how you touched on these existential concerns about religion, work, and family. I remember you saying last year that everything bad about society—all these human foibles—starts in Bedrock. Where would you take go if you had the chance to do more Flintstones? Russell: It’d be much more about the politics and about the consequences of electing ill-prepared leaders, because they say the things we wish were true. And about finding out what about the human race is worth saving. That’s kind of the main question that Great Gazoo has to ask for himself. He’d be tasked with protecting the human race as a game warden so he can sort of evolve. But at the same time, he has to make a determination about what makes these people worth protecting. It forces me to really think what is it about us that’s good and what about us as a species that’s suicidal. io9: So Fred and Wilma and the people of Bedrock would be the specimens that he garners information from? Russell: Well, he works for this planet Las Vega, where they bet on the survivability of planets. Depending on what odds he gives the Earth, they could take us off the board or say, “We’re not protecting this planet anymore, go nuts with it.” So he holds the fate of the planet in his hands, just based on the decision and the odds he assigns to the Earth. So he has a moral conscience of knowing the implications of his actions will affect an entire planet of people. As a writer, it really makes me think about us as a species, as a planet, where we’re going, and what I’d like to see—how I would like to be able to defend the human race to an alien, if I had to. io9: So what are the things you came up with? Russell: Okay, we’re not that intelligent... but, even our stupidity is not without its charms. We’re funny. I think that every mind is a lottery ticket. You scratch it off, you never know what you’re going to come up with. Take Wilma and her art and the culture people create. I think if aliens came to Earth, they wouldn’t be impressed by technology. Obviously, they’d have better technology to [be able to] come to Earth. They wouldn’t be impressed by our buildings or care that Mr. Slate had accumulated all this wealth. That wouldn’t impress them. The one thing we could do that could possibly blow the aliens away would be our arts. Our creativity. That is something they would not have on their home world. That is completely unique to Earth and these people. I think that is very much where I find the value of the human race is in its ability to create art and communicate with the universe from our soul, directly to the universe in a way other species can’t do. io9: What would you want to do with the characters—Wilma, Fred, Bam-Bam, Pebbles—emotionally speaking? Russell: Fred loses his job for a little while, which is tragic to him because he’s defined himself as a great employee and husband and father. It sends him in a tailspin of existential crisis. Wilma actually has success in her art. She’s finally able to get her art career off the ground and ends up working as the art designer for a German film director named Werner Herzrock. She designs a set for one of his movies. And in doing so, she inadvertently solves the political crisis of Bedrock. Bedrock is ruled by an idiot named Klodd the Destroyer. You think that would be the first red flag, the fact the man is named Klodd the Destroyer, but he gets elected nonetheless. Wilma comes to the conclusion that, “Maybe if we just build a film set of the White House, excuse me, of the mayor’s mansion, and convince him he’s running the place—and everyone else just knows to ignore him, to perpetuate his fantasy of being in control—we can go about living our lives. That would be the best for all concerned.” And it works very well for Bedrock. Just saying. io9: I feel like you only scratch the surface on some of the other characters. We hardly saw Barney or got a sense of his interiority and mechanics. Art by Steve Pugh, Chris Chuckry, and Dave Sharpe. Russell: Barney and Betty have a run-in with gentrification. All these hipsters start buying houses near theirs and they’re really friendly with the neighbors, but it begins infecting their ability to live in this part of Bedrock. And I think, also, what really defines Betty and Barney is their love for Bam-Bam. They found him as a baby and that’s kind of what their lives have been built on, this family dynamic. It’s really what they’re all about and we’re going to see more of that. io9: I loved the Snagglepuss short story that came out in the DC Meets Hanna-Barbera special. What are you going to be doing with him in Exit Stage Left? Russell: Issue #1 comes out in January and it picks up right where the sampler left off. Snagglepuss was called before the House Un-American Activities Committee and made fools of them. They didn’t like that so they’re preparing to call him back in to destroy him. To ruin him before the nation, to make an example of anyone else in Hollywood or Broadway by trying to defy them. They have to cooperate or all be destroyed, like Snagglepuss. And Snagglepuss has got to defend himself against them while working on a new play on Broadway. Art from DC Meets Hanna-Barbera by Howard Porter, Steve Buccellato, and Dave Sharpe. Russell: For me, it was very natural. I feel like I only want to write characters that are actual people, who have rich inner lives and have things about them that are unique in that they have their own backstory. To me, it was just one more factor of Snagglepuss’s backstory. The fact that he is gay, a playwright, from the South, living in New York… he has all these things that are informing his work and informing the times that he lives in. All he wants to do his create his art and live a life that’s meaningful to him. To love the people in his life. And yet the forces of the times—McCarthyism, the Cold War, the moral conformity of the United States—are all kind of arrayed against him doing the one, very simple thing he wants to do: live his life and express his art. And it’s about how, in a lot of ways, conformity and mediocrity are the enemy we all face. We want to live our true lives. io9: What other Hanna-Barbera characters are going to be coming in the Snagglepuss series? Russell: Peter Potamus is the director of the play. He’s very blunt. Not afraid to insult people. There’s Squiddly Diddly, who, because of his eight arms, is the stage hand. He’s able to work the stage ropes and keep everything running. Lila Lion is the wife/beard. She was the in the cartoons with Snagglepuss’ ersatz girlfriend, but now she’s his ersatz wife. Really sort of a beard, but loves Snagglepuss as a friend. There’s Augie Doggie, who Snagglepuss hires to work as a script boy on his new play and has ambition to become a serious writer himself. Snagglepuss is sort of his mentor. Daddy Doggie does not make an appearance. I just haven’t thought of any way to include him, meaningfully. Maybe I’ll have a picture of Daddy Doggie on his desk. Exit Stage Left: The Snagglepuss Chronicles is due out in early 2018.